The Google Play Store has announced the best apps and games of the year in several categories such as the most entertaining apps, best-hidden gems, competitive games, best self-improvement games and more. Besides this, it came up with the Fan Favorite category for the first time and several popular apps were rated by the users. Likewise, when it comes to dictionary and learning apps, U-Dictionary App has got the acclaim in 2018. What if you need to translate words into the multiple languages that too offline? Well, U-Dictionary is the best app that you should opt for. The U-Dictionary is sure to improve your vocabulary, make it easy and quick to translate text, use the camera to translate the text and more. Well, the U-Dictionary is the most trending app of 2018. 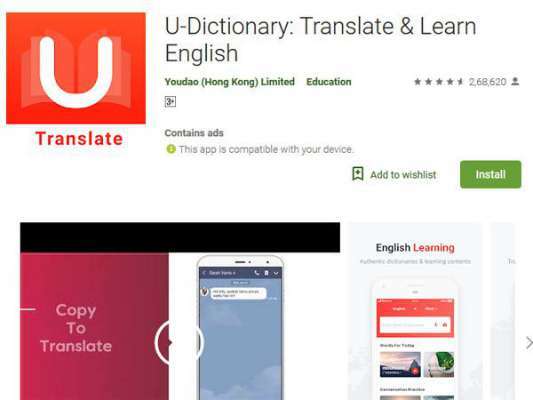 U-Dictionary is a dictionary app and one of the best English learning apps. 2018 has been a completely incredible year for the app with over 40 million users across the world. It has been rated to be the number one app in over 10 countries in the Education Category. What’s interesting is that U-Dictionary is a free app available on both the Google Play Store and Apple App Store.